It’s time to flip the calendar to the New Year. Once the party whistles are put away and the 2018 glitter glasses are thrown out all attention turns to getting our lives arranged for the next few months. With these quick tips for getting your home organized for the New Year from Beltline and Security StorAlls, you can start off the year on the right, clean foot for you and family. A New Year is the perfect time for fresh starts in all aspects of your life. Tackle those reno projects you’ve had on your mind. Pull together family and/or roommates to tackle them together. If necessary call a contractor for the ones at the top of your priority list. This may seem like a daunting task to take on but the fresh start at the New Year is the perfect time to find the necessary motivation. And it’s perfect timing before spring parties, summer barbecues and holiday hustle takes another year away from your honey-do list. Once projects are taken care of, objects will find a more natural and organized home. While it’s still cold outside, get a head start on your spring-cleaning. Pull furniture away from the wall and tackle baseboards, clean out the kitchen cabinets, and clean out the kids toybox to make room for the ones they got over Christmas. The holidays keep us running around so cleaning can get away from us at times; plus, there’s all the leftover residual from parties, vacations and general tomfoolery that goes on from October to December. Give yourself a clean start, literally. Your health and family will thank you. Once things are clean you can really get started on putting things in their place. Since you’ll already be cleaning everything out and doing some renovation anyways, go ahead and put things back in a place that will make the rest of the year flow smoothly. Look into cube shelving and bins for the rooms to keep things organized while still looking clean for aesthetic reasons. In your closets, hang organizers to keep shoes, ties, etc. in place. And in the kitchen, use dividers and shelving to keep those cooking supplies in their place instead of turning the cabinet into something that resembles a disaster zone. Clearing the clutter in your home can take more than one weekend though. Sometimes it can even take a whole year. Most of our closets are stuffed with pieces we’ll never wear again. Yet we hold on to them with thoughts of ‘maybe.’ All it’s doing is taking up space. Starting on January 1, turn all of the clothes in your closet on a hanger facing one way. Every time you wear something, hang it back in the closet facing the opposite way. When December 31 rolls back around, everything that’s still facing the first way needs to go. For those extra Christmas decorations or pieces of furniture that you’re saving for the kid readying for college, rent a storage unit. There are always a few items that we need to hold on to but simply don’t have the space for it at home. Part of organizing is knowing what you need day to day and what can be put away. 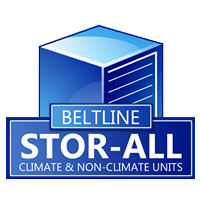 For the latter, trust Beltline and Security Storalls. Our units are climate controlled and are a perfect place to keep your possessions safe. Those first few weeks after the holidays can seem depressing. Instead look at it as a time of regrowth and rejuvenation. 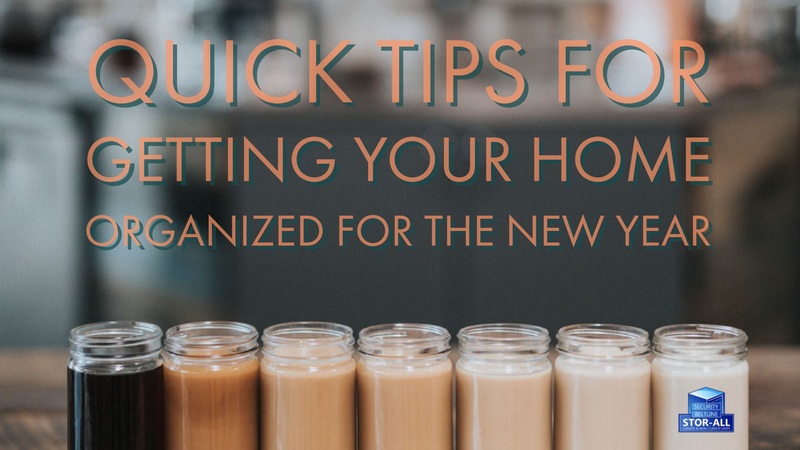 You can make those changes in every aspect of your life, including your house with these quick tips for getting your home organized for the New Year.